The Drozdovka is considered one of the most challenging and gratifying salmon river on the Kola Peninsula. The river flows in the Artic Circle therefore the climate can vary quite a bit. It is a trophy salmon destination where sizes can reach up to 30 lbs, and average catches go between 30 and 40 inches. 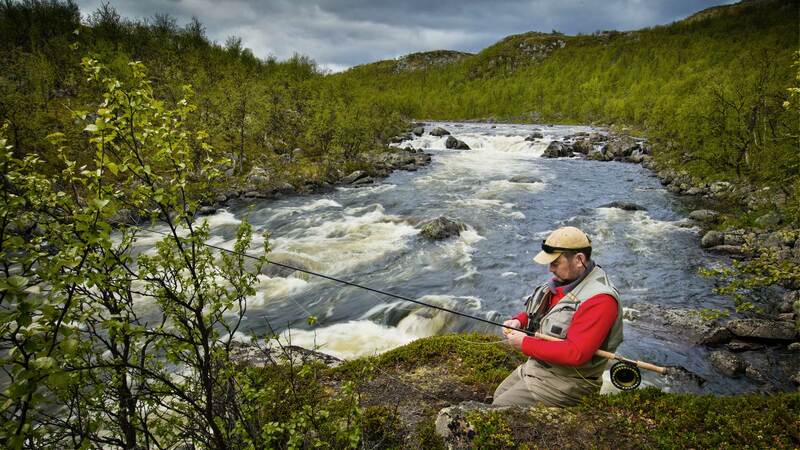 The Drozdovka is considered one of the most challenging and gratifying salmon river on the Kola Peninsula. It is a trophy salmon destination where sizes can reach up to 30 lbs, and average catches go between 31 and 40 inches. The river flows in the Artic Circle therefore the climate can vary quite a bit. The season usualy runs from beginning of JUNE until starting spring, in SEPTEMBER. The first weeks of the season are cold with clear nights, sometimes with rain and snowy and other days warm with sun. The temperature go from minues 0 degrees Cº to 20 Cº. By end JUNE the weather is tempered with occasional storms that can last a couple of days. End JULY becomes cooler in the nights and nicer during the day. In AUGUST and SEPTEMBER the climate can be quite cold and humid. During a same day it can go from sunny and warm to foggy and rainy, moreover it can snowy, therefore we suggest bringing warm clothing. Reception in Murmansk airport from 9 until 12 am, or pick up at hotel if guests arrived the night before. Transfer to the helicopter platform in Lovozero, Kitza or Tumanniy. Around 3 pm helicopter flight to Drozdovka camp (approx 1 hour flight). Arrival to camp and room accommodation. At 7 pm general talk about fishing, accident prevention and camp rules. Dinner is served at 8 pm and at 11 pm the light is out. Breakfast is served at 8 am in buffet format. After breakfast approximately at 9 am depart for fishing, anglers will reach the pools walking. Lunch is on the river and the fishing day runs until 6 pm. Dinner is served at 8 pm and at 11 pm lights are off. Each day the guides rotate pools according to previous group organization. After breakfast, departure in helicopter to Lovozero, Kitza or Tumanniy. The exact time will depend on weather conditions. Once arrived to the helicpter platform, transfer to Murmansk airport or to the designated hotel. The Drozdovka camp is located in the exit of the Drozdovka river with the Yavr lake. This is a prime location since the home pool is productive throughout all the season. Guests at the camp lodge sleep in big tents (18 m2) with wooden floor and 2 beds. All tents have heating, bed sheets and a small wardrobe. There is a main tent for the dinning room and a small bar to hang out, also showers are in a separate sector outside the sleeping tents. Electricity is 220 V and has limited schedule. All meals are included as well as non alcoholic beverages, lunch is on the river. The lodge manager is also head guide, there is 1 guide each 2 anglers, a chef and a general assistant. The camp can accommodate up to 6 anglers. Floating line + Sinktip lines (Type Rio Variotip / int s3, s6, s8). Flies: Bombers/Foam-flies in size 2-6, Sunrays, Golden Killer, Phatakorva type tubes, Willy Gun , Collie Dog , Sunray Shadow" . Also different flies of green&black and yellow&black colors. 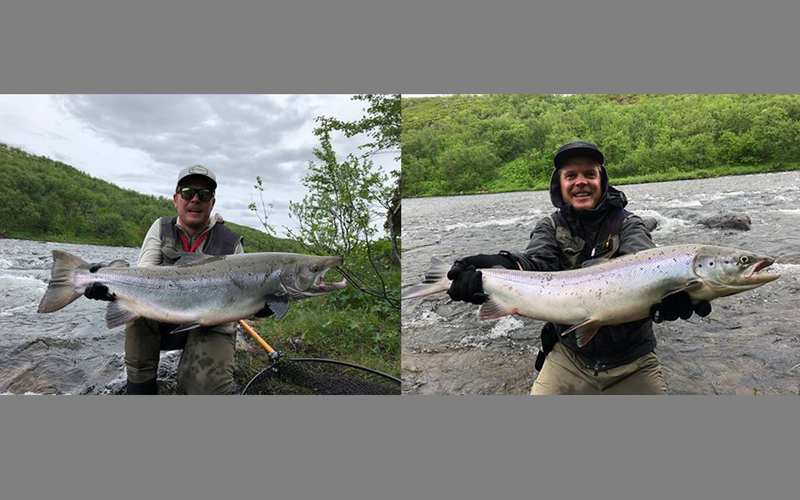 Rates include: Reception at Murmansk airport; 1 night accommdation in Murmansk; Ground transfer to helicopter platform; Helicopter flight IN/OUT; 7 night accommodation in Camp; All meals and non alcohlic beverages; 6 full fishing days with guide each 2 anglers; Fishing license. Gratuities are included in the rate, but if you wish to leave an extra gratification it is always welcome. Rates do not include: International and domestic flights, travel insurance, extras in Murmansk, fishing equipment and flies, satelite phone calls, alcoholic beverages. Notes: In case the guide is NOT required, the rate has a significant discount (consult). 4th week on Drozdovka. Group consisted of 6 guests from Finland, 5 of whom visited Drozdovka for the first time. During first 3 days weather resembled tropics: up to 28C in shadow, clear sky and light west wind. Not a salmon weather at all. Water dropped drastically and reached normal summer level. Fishing run became slower but fishing itself stayed good, though a bit harder. Fish preferred small flies, escaping big heavy spring ones. 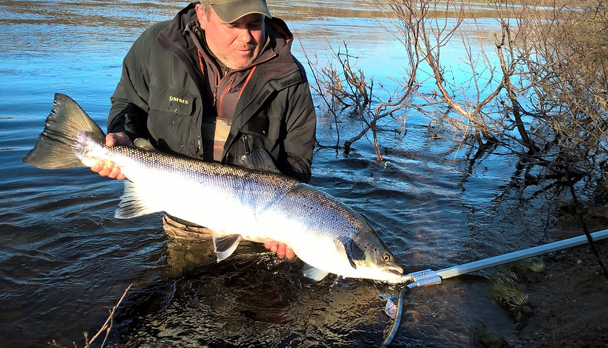 Love for fishing with single handed rods resulted for Finnish anglers in some big losts and rethinking about their gear. Despite all advice of the Camp staff, guests used single handed rod of 7 weight. Over 1m salmon bit at Corner pool, reeled off the backing and went over the island in the bay. It took long time to push it back to the pool. However, right after coming back into the river, fish dashed to Azuro and was off. Anyway, stop the maneuvering of such a fish with a single handed rod of 7 weight and 0,37mm leader is hardly possible. As a result, the leader was broken. Almost the same story took place on the next day at Waterfall, what caused unpacking of double handers. And in the next breath we landed 92cm salmon in the outflow from Firewood. However, fish tried to run away through rapids to Birches, but thanks to double hander and 0,43mm leader wd managed to stop it. Though not all anglers heard the lesson, however 7 weight single handers did appear on the river since that time. 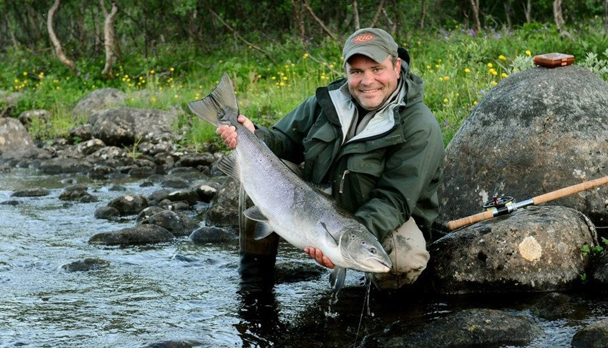 The results of those first 3 days in tropics were 14 salmon: 4 grilse, 6 salmon over 80cm and 4 over 70cm. Not bad for such weather. On the fourth day of fishing it rained and air temperature dropped till 15C. Fish became more active, it jumped and bit. 2 trophy salmon said goodbye by easily breaking 0,33mm leaders. 79cm salmon was landed at Corner, plus one grilse on Firewood. Fifth day was devoted for testing pools above Waterfall up to second Waterfall. Fish passed first Waterfall but it seems it didn’t pass Kauketzjavr lake. On the inflow to the lake and on Trout pool big trout of 60cm ran the show, which means lack of salmon here. We managed to observe and catch salmon only below the Kauketzjavr lake on Canyon pool. The result of that day was 3 salmon: 2 grilse and 75cm salmon on Finn pool. Last fishing day was rather funny. At night they tried again 7 weight single hander. Nice fish bit on Azuro and dashed downstream. The trial ended up with broken line right at backing. However, it was not the end of the story. Later the line was seen floating at the end of the pool near the rock island and it seemed that fish was still on. Esko accurately take the line, tied it to the backing and tighten it. Fish was still on! The fight started again and took long time. Finally fish was landed. It turned out to be a fresh 20lbs salmon! That day brought 3 more fish: 2 grilse in the inflow to the lake and 78cm salmon on upper Rock pool. One more fish was not counted, as it was somehow hooked by tail. The fight was spectacular! Fishing stays rather hard. The best flies were as usual: Golden Killer, Sunray Shadow and Willie Gunn. 90-99 cm - 2 fish. The biggest salmon: 92 cm and 94 cm.